October 15, 2018—This update provides a summary of the Public Meeting of Hastings and Prince Edward District School Board held Monday, October 15, 2018 at the Education Centre. It is an unofficial summary of the meeting; official minutes will be approved at the next meeting in November 2018. Lucille Kyle, Chair of the Board, acknowledged that the meeting is taking place on the land of the Haudenosaunee people. Each Board meeting opens with a Character Moment of Reflection. At Hastings and Prince Edward District School Board, Growing with Character is our intentional focus on creating safe, caring, respectful and inclusive learning environments where students develop the foundation for good character. Growing with Character is the foundation of the school board strategic plan. Through Growing with Character, we model, teach and expect demonstrations of our eight character traits which are: caring, cooperation, honesty, humour, integrity, respect, responsibility and trustworthiness. This evening Melissa Elliott, Student Trustee, North Hastings High School, asked all to reflect on Caring: We demonstrate concern for self and others. We show empathy and express genuine concerns. We consider the long term effect of our actions. 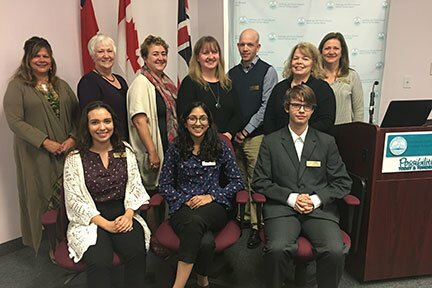 Thank you to the presenters from Stirling Public School, pictured with school board officials, trustees and student trustees. The vibrant presentation described the HPEDSB involvement in an international project known as New Pedagogies for Deep Learning. NPDL involves school boards from seven countries. It engages educators in shifting their practice and beliefs about student abilities and achievement, as well as encouraging them to take risks, collaborate with others and seek out learning partnerships locally and globally. 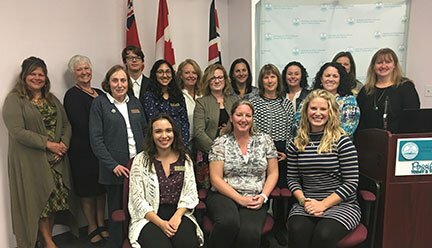 The presentation showcased the work of two teachers, Terri-Lynn Kirkey and Anne Marie Christie-Sharpe, Stirling Public School, and shared that their work is one of five projects receiving international recognition. Thank you to the presenters: Susan Carleton-Maines, Principal, Stirling Public School; Anne Marie Christie-Sharpe, Teacher, Stirling Public School; Suzanne Cholasta, Principal, Prince Charles Public School (Trenton); Tracy Demianchuk, Curriculum Services Coordinator; Andrea Kerr, Learning Support Coordinator; and Terri-Lynn Kirkey, Teacher, Stirling Public School. Thank you to the Summer Learning Programs presenters, pictured with school board officials, trustees and student trustees. Summer learning programs provide students with learning outside the school year. They consist of the Summer Learning Program for elementary students and Summer School for secondary students. The elementary program focused on developing reading skills, understanding number sense, and coding and robotics. It was for students in SK, Grades 1 – 4, and was hosted at Marmora Public School, Maynooth Public School, Prince Charles School (Belleville,) Prince of Wales Public School, Queen Elizabeth School (Picton), Queen Victoria School and Trent River Public School. Summer School had over 500 registrations from students throughout Ontario, with over 200 from HPEDSB. Just over 91% of students achieved credits. The success is due to personalized supports for HPEDSB students, Guidance teacher communicating with students daily, connecting students to their teacher, communicating with parents and individualized video links for HPEDSB students. Thank you to presenters Terri Cook, Vice-principal, Centennial Secondary School; Heather McMaster, Early Years Lead; Marg Thompson, Student Success Lead; Roger Ramsay, Curriculum Coordinator. One item was discussed at the Committee of the Whole Board meeting: Disposal of surplus property: Earl Prentice Public School. These meetings are closed to the public as provided by subsection 207 (2) of the Education Act. Board members approved the External Audit Plan. This is required as a result of amendments to Ontario Regulation 361/10 in July 2015. Since that time, audit committees are required to make recommendations to the Board on the content of the External Auditor’s Audit Plan and on all proposed major changes to the plan. Board members appointed BDO LLP as the external auditor for 2018-2019 with remuneration of $38,900. BDO has provided audit services to HPEDSB for a number of years and has developed a strong relationship with staff, management, the Board of Trustees and other stakeholders, including Audit Committee members. Administration is satisfied with BDO’s performance to date. BDO has delivered its services in a professional, timely and accurate manner. A number of district and school events (Pdf) are scheduled for the remainder of October and into November 2018. Attendance at the Indigenous Leads Gathering in Toronto, a provincial event that has been hosted by HPEDSB for the past five years. The Ministry of Education is inviting public input on curriculum-related items and the Board of Trustees will be submitting suggestions. 2018-2019 Regional Audit Activities update. Creating the Audit Annual Report. Presentation and annual update by Gord Taylor, CEO of Tri-Board Transportation Services. New rate for travel reimbursement (kilometres) to align with the Canada Revenue Agency rate, increasing one cent to 0.55 cents effective November 1, 2018. Presentation about mental health initiatives . Addition of social workers at secondary schools. Update on standardized testing (EQAO) in Ontario. Review of novels requested for use in secondary schools. Planned initiatives by the Student Senate, including creating a website and planning a student symposium next spring. Student senators meeting with students in their schools for knowledge sharing. Wednesday, October 24: Parent Involvement Committee Annual General Meeting, 5:30 p.m.
Thursday, October 25: Special Education Advisory Committee, 5:00 p.m.
Monday, November 5: Executive Committee, 11:00 a.m.
Wednesday, November 7: Audit Committee, 3:30 p.m.
Monday, November 12: Program and Human Resources Committee, 5:30 p.m.
Monday, November 12: Operations and Finance Committee, 7:00 p.m.